One of the good restaurants in the Columbia, MD area is Victoria Gastro Pub. They have a small but unique menu with a great beer selection. There is a limited number of entrees, but absolutely the highlight of every visit is the Poutine (pictured above). Their version of Poutine is duck fat fries (french fries cooked in duck fat), with duck confit meat sprinkled on them, covered in melted gruyere cheese, with some duck gravy. They usually have a little sea salt and a faint rosemary flavor on top of the duck essence. It is soooo good, we usually wipe the dish clean. Something about duck fat fries is so appealing, but they are so rich, you won’t be able to have any for a couple of weeks. Then the craving starts all over again. In our latest visit to Victoria, we found a really different beer, Wells Banana Bread Beer. A wonderful beer from Wells and Youngs Brewery in the UK. This beer was delicious. I am not usually a beer drinker, but this was really good. A smooth ale with a faint taste of bananas. Not overdone, not sweet, not fake, just a great banana aftertaste, and no bitterness. Now a banana flavored beer would not have been my first pick to go with duck fat fries, but somehow it just worked. Actually, I think the banana beer would have gone with just about anything. As I was thinking about the meal, I’m not really sure what type of wine would go well with Poutine, it seems to work better with a beer given all the strong flavors. The banana beer is seasonal, so it probably won’t be around for long. 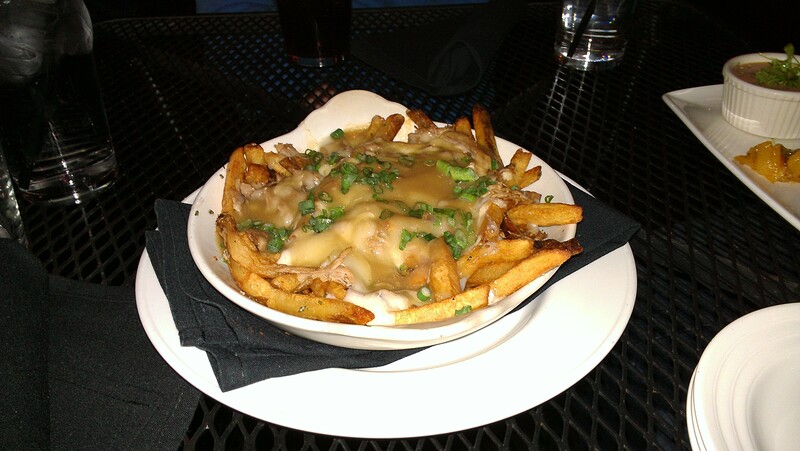 The Poutine is available always at Victoria Gastro Pub, and always been the highlight of dinner. For me, flavor is everything. Creating a great meal with layers of flavor is one of my pastimes. Finding a great wine that goes well with a meal is one of my passions. But when you combine the two, great things can happen. Thus the name, Flavor Blender. Combining tastes, ingredients, textures and more is what this little endeavor is all about. So what will you be seeing here? Well recipes for sure. Probably some wine reviews too. The occasional restaurant review. And most importantly, the combination of flavors and the experience that creates. I feel like I should share some of my “philosophies” that will guide what I write here. First, a recipe is only a suggestion. I find that adjusting a recipe to my own tastes usually works out best for me. That usually means more flavor or some extra ingredients to match other parts of the meal. If it doesn’t taste good, don’t eat it. Occasionally, it just doesn’t work. Either the flavors don’t work, or something is over-cooked. In these cases, call the Pizza guy. If it doesn’t taste good, don’t drink it. Everyone’s wine tastes are different, and you should drink wines you like. No one, no matter what type of “wine expert” they are, can tell you what you should like. Now, you should try new things, because it’s a great way to learn, and you may just find a new favorite. There are actually bad wines. Wines can go bad, either from being too old, or not being stored properly, or from having a bad (tainted) cork. Don’t drink these thinking you don’t appreciate fine wine. Stick with the thought above, if it doesn’t taste good, don’t drink it. I think that’s enough guiding principles for now, I’m sure others will come up as we go along. So now that Flavor Blender is officially off the ground, I need to start getting some posts together. I’ll be working on that and get some content up here. Let the journey begin!